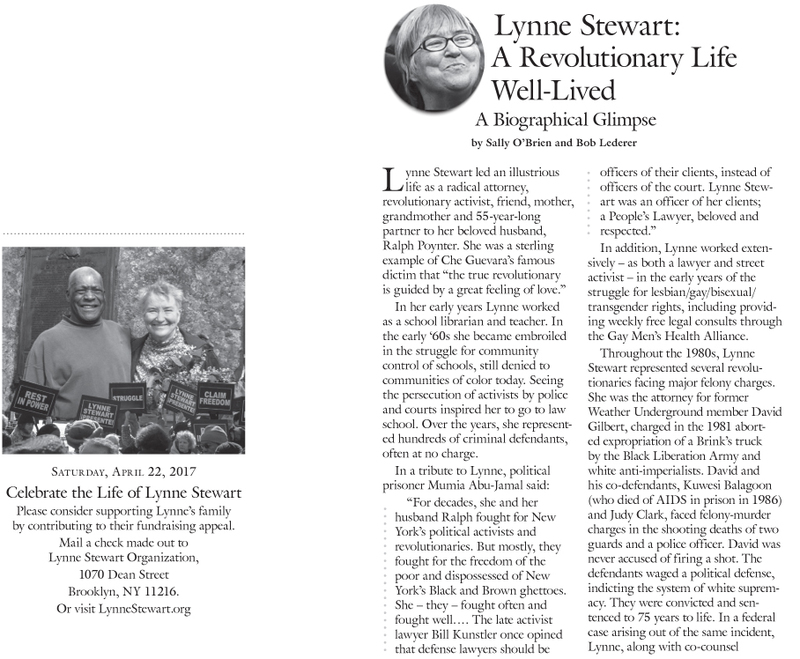 Lynne Stewart is a radical human rights attorney who has devoted her life to the oppressed – a constant advocate for the countless many deprived in the United States of their freedom and their rights. 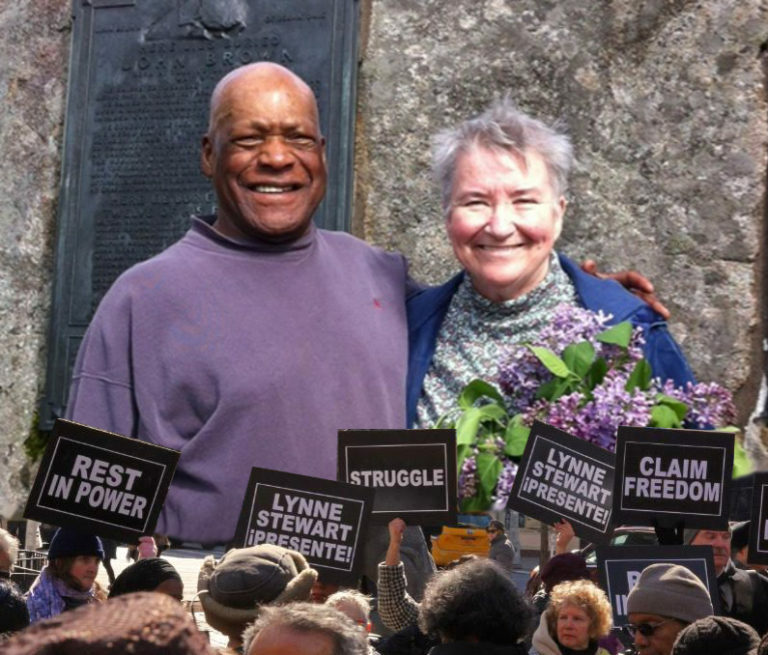 Lynne has been falsely accused of helping terrorists in an obvious attempt by the U.S. government to silence dissent, curtail vigorous defense lawyers, and install fear in those who would fight against the U.S. government’s racism, seek to help Arabs and Muslims being prosecuted for free speech and defend the rights of all oppressed people. She was arrested in April 2002 and arraigned before Manhattan federal Judge John Koeltl, who also presided over her trial in 2004. She was convicted, and received a 28-month sentence in October 2006. However she was free on bail until 2009, when the government appealed the sentence. In late 2009 Lynne was re-sentenced to 10 years in federal prison. Lynne was freed from prison on December 31, 2013! In the meantime, tune into Ralph’s “What’s Happening” radio show every Tuesday evening on BlogTalk Radio. 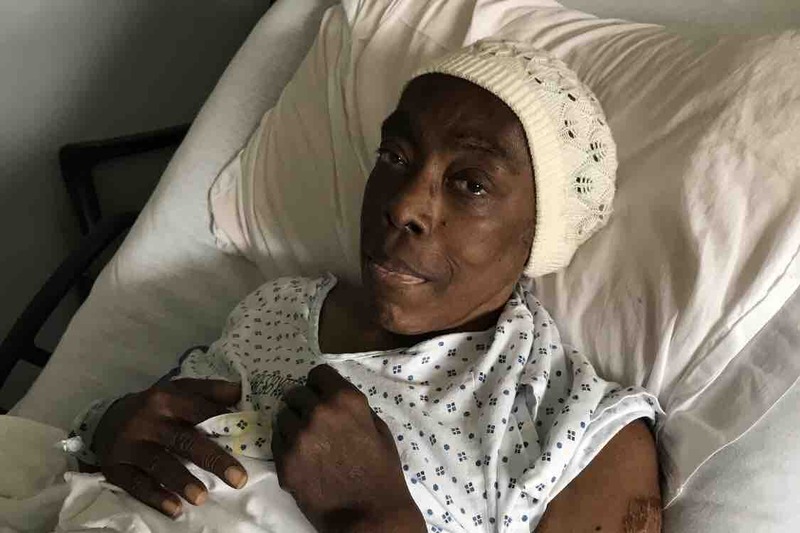 Help Ramona Africa Fight for Her Life! Click here to watch the archived video of the memorial. Click here to view the many beautiful tributes to Lynne from people around the world. 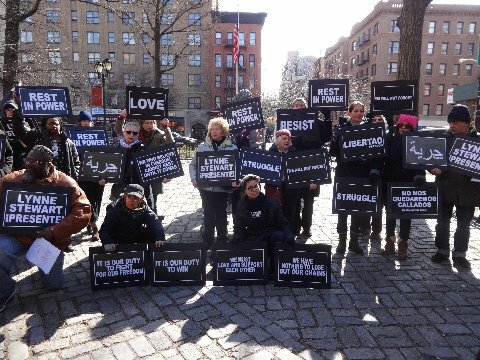 Long live People's Lawyer Lynne Stewart! Please continue to donate to the fund to help with the many care-taking expenses that Ralph Poynter has had to bear by clicking here. If you have done time as a political prisoner or prisoner of war or person of conscience: please be in touch with us! Thanks to the generous support of Resist, Inc. - Funding social change since 1967.